Did you know that snoring could kill you? While this nighttime habit may often be the subject of jokes, it’s important to realize that the repercussions of untreated sleep apnea should not be taken lightly. This common sleep disorder can lead to cardiovascular problems, car accidents, stroke, heart attack, and even sudden death. But, many patients can’t tolerate the CPAP machines used to treat this conditions – the air forced into their noses and throats all night long can be uncomfortable, and the masks and tubes are cumbersome. Should you take the risk and just not use the machine? Rather than jeopardizing your health, there are dental alternatives from Dr. Dale Greer, your premier sleep apnea dentist in North Dallas. This disorder is the second most common sleep issue behind insomnia. It usually occurs when the airway becomes obstructed while a person is sleeping. The jaw and tongue relax, sliding back and blocking the throat, which prevents you from breathing properly when you snooze. Since your brain is smart enough to know you’re not getting the air you need, it will cause you to wake up to start breathing, but not enough to consciously notice that you’re awake. These “micro-arousals” can happen hundreds of times a night, leaving you exhausted the next morning, but without knowing why. Check out these risk factors for sleep apnea and quiz yourself to see if you might be suffering from this condition. What Are My Alternatives To CPAP? Since many patients can’t tolerate CPAP machines for their sleep apnea, they will often stop using them and simply leave this potentially deadly condition untreated. Rather than putting yourself at risk for serious health problems, you can see Dr. Greer for an oral appliance in North Dallas. This 100% custom made device is similar to a nightguard and is worn while you sleep. It gently moves the jaw and tongue away from the back of the throat to keep your airway open, allowing you to breathe freely at night. 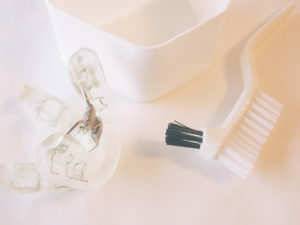 It’s comfortable, inconspicuous, and effective – custom oral appliance therapy works for about 80% of sleep apnea patients. If you have sleep apnea, don’t suffer with a CPAP, and don’t put yourself at risk by not treating your sleep disorder. Schedule your appointment with Dr. Dale Greer today and get the rest you deserve!